Mine is to offer shirts of the month more regularly than I am right now. I’m really hoping I can keep up with this goal as it’s one of my favorite discounts to offer my customers! The only New Year’s resolutions I want to make are to sew more for our grandgirls, to become proficient with PE Design-Next, and to learn how to use the Silhouette Cameo we got a over a year ago. Be More service-minded and more confident in my embroidery projects???? Get a lot better at embroidery. Manage my time better & of course lose weight!!!! 2015 a big year for me! Retiring and looking forward to more time to sew, embroider and applique for my girls! My resolution is to be kind and good…. and patient…. To do one Christmas project a month so that I’m not going crazy the last couple of months before Christmas!! I would love to make tree skirts and stockings for all 11 of my grandkids and all 3 of my kids and their spouses!! Dreaming . . dreaming . . . 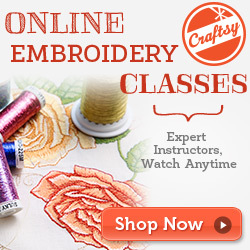 Learn to appliqué and sew more and of course become more healthy! Thank you so much for the give away! I told my husband last weekend that I would love to go but then I talk myself out of it! My resolution is to start an embroidery business! This give away would be a step in the right direction. I got MWP for Christmas after reading up on it on your blog! Thank you for your help! Share my embroidery with others! And learn; better time management! To get all my supplies organized. My resolution is to put more of an effort into my appearance. Monogrammed fleece pants and a pink Notre Dame hat are only cute occasionally….not every third day! Yikes! What happened to me?? I want to use my machine more AND buy LESS fabric haha! I need to use up some of what I already have! Do you think this is something I can live up to? Maybe half of it…………. 1) To do more with my kids. 2) To make less excuses and just get things done! TO FOCUS MORE ON MY SPIRITUAL LIFE AND LOVE ALWAYS. TO FINISH SOME OF THE PROJECTS THAT I HAVE STARTED AND THEN WORK ON SOME CUTE STUFF FOR MY NEW GRANDDAUGHTER. about embroidery and focus on that part of my little business. I agree! Facebook is getting more and more useless!! Would love to go! Just purchased SWP and PR655. Going to make this my retirement business! I have two resolution (attempts 😉 ) One is to do more embroidery and sewing this year and be ahead of the grandkids birthdays etc and not late and the other is to write more in my blogs. I would love to win the ticket as it would be such a treat! Thanks for the chance! My goal is to set time aside to use my sewing skills as a service for those in need. To set quarterly and weekly goals for myself to try to actually get things done! To come up with new ways to interact with our customers…current ideas of design parties. 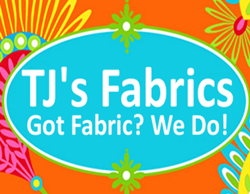 We will pick a somewhat simple design, take multiple buckets of fabric and allow customers to individualize their designs with their own fabric choices. Another idea is a t-shirt of the month club. To stay on top of my orders and not get so behind!! Sew more, exercise more and read my Bible daily. Growth is my word for the year 2015. This applies to many areas of my life, just not weight. Would love to come to market! My resolution is to finally learn how to use SEW WHAT PRO and get some confidence about it! To attempt to complete 5 random acts of kindness a week. My resolution(s) this year is to write 2015! I just get so frustrated when I mess that up.Lol! I’m sure im not the only one that feels this way. Get so use to writing the year & it changes on us! insert chuckle. I will be going to the Embroidery conference & maybe we will meet in person. I’m really excited about this trip with 2 of my favorite embroidery ladies. Its 50 days away..but who’s counting them down. haha! It will be my 2nd girls trip. I can.not wait! I would like to experiment more with my embroidery machine and be less intimidated with the process of downloading projects. Would love to share this trip with a friend who took me to B’Ham with her to shop for Christmas. To learn all I can about my new 10 needle, help as many families as I can through our childhood cancer non-profit, but most importantly continue to make sure my son is always my first priority. Mine is 1st to focus more on family and the Lord and 2nd.. to try and eat better, 3rd.. to find more creative ideas for my business!! I don’t normally set resolutions because with 3 kiddos not much changes.. LOL!! I am looking forward to 2015. I plan to meet each Wednesday with a group of young moms for bible study, mentoring and sharing sewing goodness whenever possible. I am going to exercise weekly with a group of ladies (more my age 60) and stay healthy….when I feel good I enjoy sewing so much more. My resolutions are to spend more time with my children and less in front of the machine. Business related, I would like to offer some new products – shake it up a bit. To get more comfortable and creative with my embroidering! To feel better and to be a much better person and to live daily , how I should for Christ. My resolution is to go to bed each night with all the dishes in the sink clean. I am getting ready to make a big change during 2015. With this ahead I want to promote my business daily. Its so easy to get busy and not post anything for the day. During 2015 i want to either open an Etsy store or a web site. They both scare me, but I am up for the challenge. My 2015 resolution is to be more disciplined and concentrate on building my business by doing more appliques, venturing into rhinestones with my new Cameo and being more organized. Life gets too busy with other “stuff” so it’s time to prioritize! Happy 2015!! 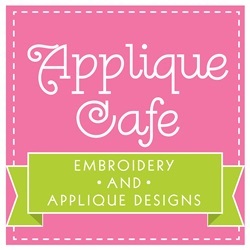 Renee, email me at rosemarygulledge@appliquecafe.com!!! You are a WINNER! Happy New Year! One of my resolutions is to get out of the sewing room occasionally! Would love the tickets to the embroidery market!!! I don’t really do resolutions, really just updating and prioritize my “to do” list. I have 3 that are sewing related: 1. Get my sewing area better organized and more functional. 2. Make my daughter’s Confirmation dress. 3. Work on my list of both unfinished and wish list items. To get more active in my church in all phases. Start earlier on making Christmas gifts. I would like to have a example of all my designs, but I think that is out of the question since i have so many. I would enjoy getting tickets to this conference. i missed the Applique Conference in June. I learn so much from you and others like you even though I have been embroidering for about 13 years. All of my resolutions/ goals are business minded. I made the plunge in 2014 to do my embroidery business full time, so 2015 is going to be all about growing it and making it bigger and better! I want to offer more products and find better ways to use social media. I’ve been off the facebook train for years! But have never ventured into the world of Twitter…maybe this year?? Be more disciplined to get things done. To be the healthiest I can be and to spend more QUALITY time with my family. It’s gonna be a good year! I am not really making any resolutions, BUT I sat down with my kids after Christmas and we made a list of fun things that we can do this year. I’d also like to be better at planning ahead, and procrastinating less!! Not a resolution, but I will learn how to use my new embroidery machine! Just replaced 10 year old Babylock with a Bernina Deco! Would love to come to Market for new inspiration. My New Years Resolution is to sew more and finish more projects. 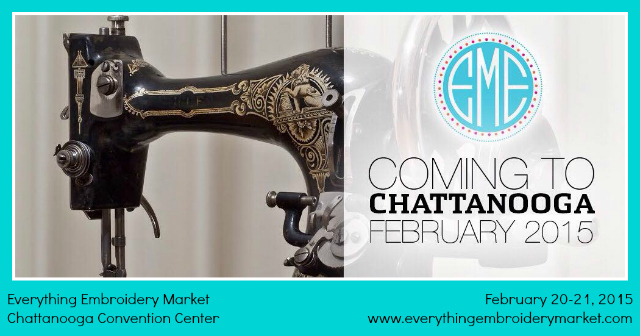 and I would love to go to the Everything Embroidery Market in Chattanooga! Contests are fun! To make cute matching outfits for my 4 small children (4 yrs and under) and not be overwhelmed by holidays! I am always running behind! To make something for myself is another resolution!! I live in Chattanooga and would love to go!!!!! Applique more goodies for my grandchildren and get organized. I am going to try (no I will) get my sewing room organized. I hope! To make more outfits for my 3 grandchildren and hope to finish my first raggedy quilt…that I started 1 yr ago. Chattanooga is close so I’m gonna try to attend. WIll come by your booth. Love your website and designs sew out great!!! I would like to spend more time sewing and be more available to family and friends this year. I don’t normally do resolutions but I am setting some specific goals for this year. First and foremost is for our family to grow in our spiritual life through family devotions and outreach through our church Dream Center. Second to continue to focus on my health . My final is to grow my business with a more strategic focus. Thank you Rosemary for all you do. You taught me through your blog and I will forever be thankful to you for that! I am already planning to attend, so to get free tickets would just be icing on the cake! Get more done for stores on Eastern Seaboard. My goal for 2015 is to be more like Christ, serve my fellowman, and embroider and quilt! My New Year’s Resolution for 2015 is to make at least one item a week for Christmas so that I’m not finishing my items at the last minute (after everyone else’s is done)! A friend and I are attending the show! We are both excited and can’t wait! Mine is to do a Christmas project every two weeks throughout the year. In 2015, my main personal resolution is to be more active/healthy. Yes-its a very typical resolution. I have been doing pretty good with the working out but need to implement better eating for the new year. For my business, one of my resolutions is to not be so messy!!! HA! I want 2015 to be the year I take better care of my health. I also want to use my embroidery more in a service oriented way. I want to donate embroidered items to the Chambless Children’s Shelter in Chattanooga. I also want to make pillowcase dresses for our church’s mission trip to Honduras. My resolution for 2015 is to be a better person and to get closer to God. It is through his love and compassion, that I get to do what I love (embroidering). I would love to go to Chattnooga Embroidery Market and this would feed my passion. Hope I get chosen for the tickets. Eat healthier, manage time better. Megan, email me at rosemarygulledge@appliquecafe.com! You are a WINNER!! My resolution is to do a better job of promoting and growing my business! To Learn how to use my new machine!!!! My New Year’s Resolution is to really soak in and enjoy my babies more…they are growing so fast! Totally agree with you about Facebook, but love reading your Blog so please continue when you have time. I am blessed with three children and seven grandchildren so totally understand your time restraints. When I do have time to applique or monogram, your blog is my go-to-place for advise and your site is my fave for applique designs. Thanks so much and have a great New Year! Oh, I should add when it’s not the Iron Bowl, our Alabama family roots for Auburn as our grandson is a freshman there now. After we all got over the shock, we are so happy for him as he is so happy. I hope to get organized, stay organized, and finally empty the plastic bins of projects waiting to happen! My main goal for this year business wise is to embroider, sew, or create items a week, and to remember to take pictures. My family goal is to spend more time with my family and not accept last minute orders that take me away from them. My personal goal is to not sweat the small stuff. My resolution is to sew more fun clothes for my new granddaughter this year. Fun! Mine is to stop drinking mountain dews and to light a fire under my faith this year! My New Year’s Resolution is to learn to let the little things go and focus on what is important in life. I resolve to take advantage of time with my loved ones. My resolution is to exercise more and be more centered in my Christian faith in 2015. 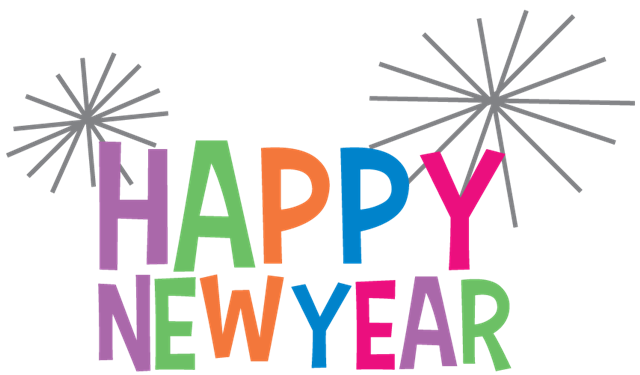 Happy New Year, my resolution is to bond more with family and friends. Mine is to embroider and sew more to start a business. Would love to win a couple of tickets! My New Year’s goal is to learn the Cameo Silhouette to compliment my monogram habit! My New Year’s Resolution is to live my life so that others can see God’s love in my attitude, behavior, and actions daily. #2 Keep my sewing room neat for more than one week. My goals include being more productive by not spending so much time browsing the internet when I could be actually making something. My head is full of ideas that I need to make happen! I am guilty of browsing the internet too!! I really hope to calm down and finish some of the projects I’ve started and stop starting new ones before I complete one. I need to forgive myself and realize sewing and embroidery projects don’t have to be perfect to be enjoyed. I look forward to reading your blog and appreciate the help you’ve given me these past few years. I would love to go. I have never been before! take more time for myself! 1) Be present mentally when I am physically with my family, friends, etc…, but also 2) do something healthy for myself! At 60 weight loss and wrinlkes are ok. I am not hoing to beat myself up. Instead i will look at myself with unconditional love and therefore be able to handle any situation in the same way. Sewing has been my passion since I was young. I can stay up all nite and totally enjoy every second. As i have with different spontaneous projects to arise. I’m working to pay for my machine but need my machine to become self employed. Then I can allow myself the freedom to do what i so love. Take trips from Rainbow City to Chatanooga to eat at Sluggos/ vegan restaurant or Cashews. Such a treat would be to attend an embroidery show and eat great food. What a fine trip that would be! Bought my machine at a craft show! Hehe loved it!!!! Thanks and happy sewing! My resolution is to start on Christmas projects in January!!! Pretty much my resolution is to budget/save! We are paying off 2 cars and we’ll be FREEEEEE once those are gone! Would LOVE to go to EEM! Sounds like so.much.fun! To clean up as I sew…..instead of waiting till i cant see my studio! I want to develop a better bible study time & eat more healthy to help my husband with his diabetic problems! I would love to go. Only had my machine for a year. I need ideas. I would love to be able to attend the event!!! Super exciting to even think about the privilege. Cross stitch more. Actually it’s not… its embroidery on my new machine but my husband calls it cross stitch:) love to win I could drop him off at his dads near Chattanooga! My goal this year is to complete 1 5K per month for the year 2015! I am 90 lbs overweight and I knw I can do it! I am also praying for God’s direction on expanding my small home monogramming business! I plan on being more organized in 2015. I would love to go to EEM in Tennessee. That would be so awesome. Daphne Martin, email me at rosemarygulledge@appliquecafe.com! i am determined to at least begin quilting a king-size quilt I put together almost 3 years ago. To read the New Testament through. To be a better wife, mom, Mimi and just in General am”better” person. To reduce my iPad time and start exercising with the extra time. I’d love to win and have a great excuse to visit my sister in Tennessee!!! Pretty please!?!?!? 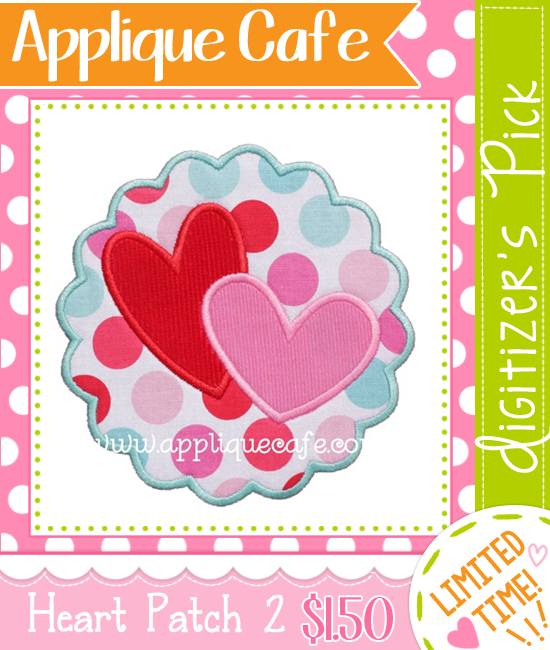 Cyndi Dickens, email me at rosemarygulledge@appliquecafe.com!! awesome thanks!!! I want to get healthier.. Physically spiritually emotionally and to learn to be content. My new motto is progress not perfection. Happy 2015 to all of you! I am new to embroidery and especially new to Applique. 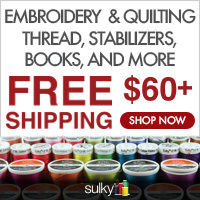 I found this site through reading post in some groups I joined one being Brother PE Embroidery Group. I found your blog and really feel confident that I can do this now after reading your tips on how to. I want you and others like you to know how much you are appreciated for your helpfulness, espescially to beginners. I am so excited to get busy on so many projects I wanted to do, now that I am not scared to death to try! Thank you so much for your time and sharing your knowledge! I would love to go to the conference! It would be like Disney World!